Leggo my Eggo! Remember those commercials of two kids fighting over that last waffle just as it popped out of a toaster? I know how those kids felt because I grew up loving boxed frozen waffles, too. But I also adored the fresh taste of right-out-of-the-waffle-iron waffles. As a busy mom, I'm often tempted in the frozen food section as I pass the perfectly arranged boxes with pictures of golden-brown waffles piled high under amber syrup and perfect pats of butter, but when I think about the ingredients most boxed frozen waffles are made with AND the cost of them (6 waffles for $4! ), it doesn't seem worth it to me at all. Not when I can easily make my own healthy, delicious waffles at home for less money than the store brands (try 10 for under $2!) and not forego the convenience of frozen waffles. My solution is to make a single or even double batch of homemade waffles and freeze what we don't eat for breakfast. Then, no matter how much of a rush we're ever in in the morning, I'm always prepared for my kids last minute request for waffles and this couldn't be more nutritious, so I know their bellies are filled with truly wholesome stuff and no one has to fight for the last one since I always have them on hand! 2. Sift the first 3 ingredients into a bowl. 3. In a separate bowl, whisk the remaining wet ingredients. 4. Slowly add the dry ingredients to the wet ingredients and whisk until combined. Do not over mix. 5. 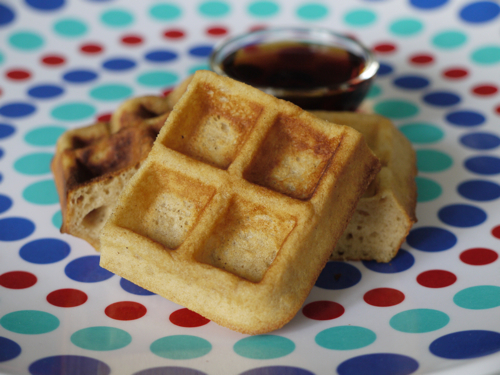 Pour 1/2 cup of batter into a greased waffle iron and cook about 3-4 minutes or according to manufacturer’s directions. *To freeze: Allow to cool, place in a Ziploc bag, label and freeze. When ready to eat, place in toaster oven until heated through or in the oven at 300 degrees and heat for 10 minutes or until heated through. My son LOVES these waffles. He likes to dip it in greek yogurt mixed with mashed up raspberries. Yum Yum! We made these this morning, following the recipe exactly. They came out nice and crispy. We have have a round belgian waffle maker so it took almost one cup of the batter to get a full waffle. At that ratio I'd get about three and a half circular waffles from one recipe. My husband and I ate them with just a touch of maple syrup and they were very tasty. My two year old ate over half a big round waffle and that was after eating 8oz. of yogurt while I cooked the waffles! Not enough left to freeze, but I don't anticipate problems since the texture was great. Next time I'll make a double batch. I want a belgian waffle maker so badly!!! For now I'll have to stick with making pancakes! If only I had a waffle iron! But I will definitely be making these as pancakes as mentioned above. Thanks! So excited about trying these tomorrow!!!! Although, I will be making the pancake version. I have a 10 month old who refuses purees so i have to be creative about getting enough nutrition in her diet and I'm thinking waffles may be to \"crispy\" for her. She only has two teeth :) Thanks so much for such awesome recipes and ideas. They have helped out so much!!! My 11 month old doesn't have teeth either and I started giving him toast and waffles when he was ten months. The crispy wasn't a problem. As long a your baby is chewing she should be fine. Give it a try, and just watch carefully. Good luck! I'd also like to know if these can be made dairy free for my sensitive daughter. Maybe substitute pumpkin Puree, applesauce, thoughts??? Thanks! Just made my 4th batch of these, we love them! I have problems with mushy waffles and found that if we cranked up the heat that it helped them be more crispy. We have a cuisinart that makes 6 square waffles. I add zucchini into mine with a few chocolate chips. Protein (yogurt) and veggies for breakfast? Score! I love weelicious. This brought a tear to my eye!! My 5 year old who doesn't like anything other than (and I'm not exaggerating) waffles from a box in the morning and \"yummy pasta\" (which is from a box and has tons of sodium) for all other meals. This kid will not eat any sauces, cheese, condiments or even jelly w/ his PB&amp;J... I'm constantly at a loss trying to feed him. Well, he LOVES these!!! Thank you so much for this recipe!!! Super yummy! I doubled the recipe and was able to make 7 round Belgian. Hubby loved them...hope my 3 year old will too. We just made these...didn't have any yogurt so I subbed half cup pumpkin...my toddler is saying more, more, more! Used coconut oil for the oil and I don't know if that's what made the difference but they were AMAZING!! Home late and wasn't sure what to have for dinner and decided on breakfast for dinner and I'm glad we did. These were delicious. I say were, because my family decided to eat the entire batch in one evening. I had planned to freeze the remaining. I don't mind making these again, the recipe is fantastic, and easy!!! I substitute applesauce for the oil. And I use 1 c. whole wheat flour and 1/2 cup all purpose or white whole wheat flour so they are a little more crisp on the outside. Love this recipe! I haven't tried those substitutions, but I think they would work at a 1:1 ratio! Let me know how it works out! Made this today and it was amazing!!! Thank you! !